Say YES to the engagement ring by designing your own. Select metal type, number of stones, and stone type. Then contact world renowned Cornelis Hollander to create it. Pick any of the following settings to get started. This romantic setting encircles a shimmering Swarovski gemstone, which is surrounded by G color, VS2 clarity accent stones. Precious metals include 14K, 18K, and Platinum. 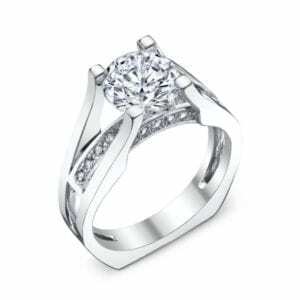 Further customizations can be made by choosing a diamond for the center stone. Diamonds can be up to 4 carats. This design masterpiece includes VS2 clarity, G color diamonds on the bar underneath the center Swarovski gemstone. 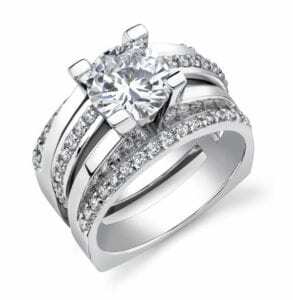 This ring is available in 14K, 18K, or Platinum. Diamonds up to 4 carats can be incorporated into the setting for a unique look that will have your significant other saying “yes” to the ring. This glamourous engagement ring features bold, beautiful and sharp lines, with accent diamond stones and a center Swarovski gemstone. 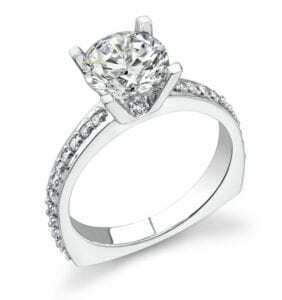 Diamond center stones up to 3 carats are sold separately. This ring is available in your choice of 14K or 18K white, yellow, rose, or two-tone gold as well as Platinum. Carve out a timeless love story with a beautifully customized engagement ring. This solitaire ring features your choice of precious metal and G color, VS2 clarity diamond side-stones, and a center Swarovski gemstone. 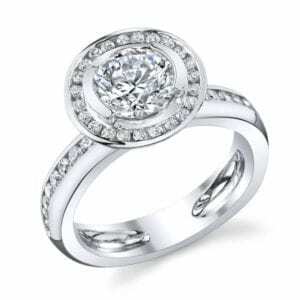 Up to 3 carat diamond center-stones can also be set in this ring. Cornelis Hollander is a full-service jewelry design company located in Old Town Scottsdale. This is where all our jewelry designs are handcrafted. We are happy to consult with our clients to create their dream piece. Custom designs are available locally as well as throughout the U.S. Contact us at (480) 423-5000 to learn more.